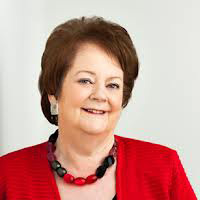 Mary O’Rourke is a former Irish Fianna Fáil politician. She is a former Teachta Dála (TD) for the Longford–Westmeath and Westmeath constituencies. She served as Minister for Education (1987–91), Minister for Health (1991–92) and Minister for Public Enterprise (1997–2002). She was also a member of Seanad Éireann from 2002–07. In 2011 she was appointed to the Board of Directors of Educate Together.